INTRODUCE AT 8 LBS. FOR BABIES UNDER 8 LBS, CONSULT YOUR HEALTHCARE PROFESSIONAL. Step 1. 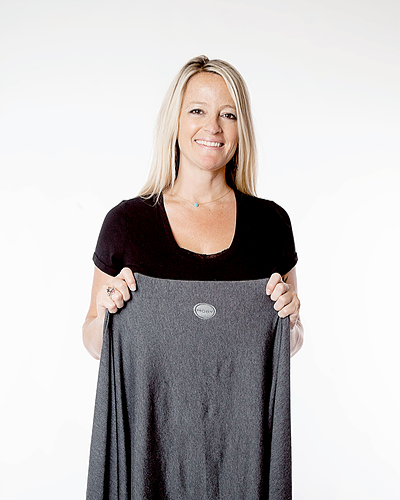 Place the MOBY Wrap across your waist with the logo centered at your navel. Step 2. Wrap the ends of the MOBY behind your back. Make an “X” on your back by crossing the two ends up over your shoulders. Step 3. Now it’s time for baby. Hold baby up on your shoulder. Step 4. Gently lower baby into the fabric section with the logo. While baby is in the fetal position, pull the fabric up to baby’s shoulders and down under baby’s bottom. Step 5. Holding baby securely with baby’s legs tucked in; bring one fabric end over baby’s back towards your opposite hip and guide under baby’s bottom.